Ready for a Christmas Party? We didn’t have Christmas parties. We didn’t have any parties of the kind where you invite people over to socialize. We did gather on holidays and for birthdays but those were family affairs. However, I did come up with this photograph of my sister Pearl all dressed up for some sort of formal party. We can see it’s Christmas because of the card display on the mantel. It was the winter of 1966. I wonder what my mother is talking to her about. She looks rather dressed up too. I still have that chair and it’s mate. Today is Pearl’s birthday so I thought it was appropriate to post this photo on several levels. Perhaps Pearl will see this and remember what party she was going to. What ever they were talking about they were both very relaxed about it. Beautiful sister and mom, I like her smile. What a wonderful photo, mom has on an apron, right?? Pearl's dress is elegant! How fun! Yes, Carol, she does have an apron on. And your mother looks like Pearl's wise older sister, not a different generation entirely! you all are beautiful women. 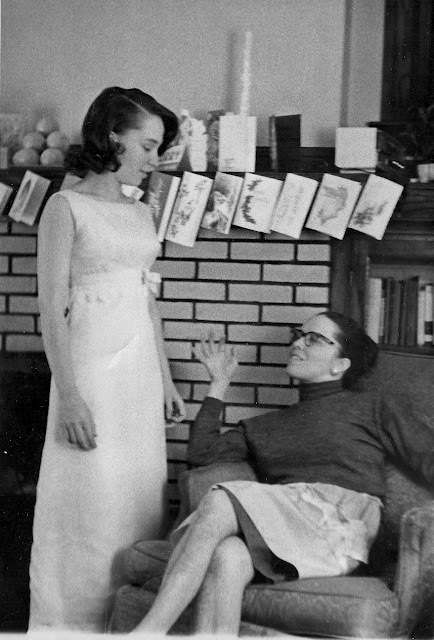 Since I graduated from high school in '67, the style of the dress is very familiar. I also noticed you Mom was wearing an apron — and not pants. How things have changed. Kathy, my mother either had just gotten home from teaching or was going somewhere. She didn't dress like that just to be around the house. She did wear aprons though. "i think this was actually my prom dress? bought it at Christmas to catch a sale cuz i don't think the prom was until later. but i do remember this was a pink dress and i LOVED it." I love Pearl's dress too. Lovely prom dress, and in pink, wow! I graduated in 62, so I really know the style. Happy birthday to your sister Pearl! She looks absolutely lovely in this picture. Both are very pretty. What an elegant dress..Pearl has great taste. Happy Birthday Pearl. Very stylish prom dress- I recognize the style too- and I love un-posed family pics. Happy Birthday Pearl! I bet Pearl was going to the Co-Ettes formal which always happened in December since she looks like she is wearing a formal dress. Your mother was my social studies teacher at Roosevelt Elementary and I went there when Pearl went there although she was a couple of years older than me. And when my mother starting teaching there after I left, your mom and my mom became good friends. I also have a place in Idlewild. It is great to see these photos and to reminisce. I always loved going to your mom’s class.